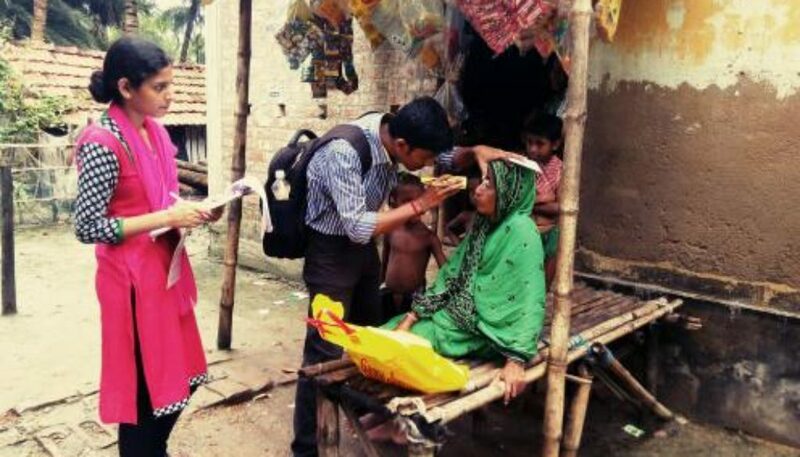 In this blog post Debjani Barman discusses how gender cross cuts with other social determinants to influence eye health care seeking in India. Debjani Barman, Institute of Health Management Research, Kolkata, India and Future Health Systems Research Consortium. Gender wise, women experience a higher burden of visual impairments given their longer life expectancy and poor access to health care services. The burden is higher among women50 years and above (WHO 2010). Apart from socio economic factors, gender dynamics play a crucial role in health care seeking. How gender cross cuts with other social determinants of eye health care seeking, such as marital status, gender of children, living arrangements, and economic dependence,has been answered in a recent study among the elderly population (more than 50 years and above) in the Indian Sundarbans. The Indian Sundarbans–situated in the world’s largest river basin – are intersected by numerous tidal creeks and estuaries. This typical geographical characteristic makes the region highly inaccessible. The broken linkage of transport (road-water-road)inflates both the travel time and cost to any health facility. Definition wise, there are five criteria for establishing whether someone has a visual impairment:normal vision (vision > 6/18 in both eyes), low vision, (vision < 6/18 – 6/60 in the better eye) economic blindness (vision < 6/60 – 3/60 in the better eye), social blindness (vision < 3/60 in the better eye),and one eye blind (vision < 6/60 in one eye and better than 6/18 in the other eye), arranged in terms of increasing level of visual impairment. Age wise, the elderly are divided in three sub groups: young old (50-64 years), middle old (65-74 years), and old old (75 & above). There is ahigher share of women suffering from low vision, compared to their male counterparts. Age group wise, the share of economic blindness and social blindness is higher among the old old group of elderly people. In the study area all the respondents who are living alone are female, however, the majority of them are living with a married son’s family. In terms of current marital status, while the majority of men are currently married, most of the women are widows. This factor is particularly important in the context of the Sundarbans given the lower mobility of women and geographical inaccessibility. There are higher share of women who do not seek any eye care irrespective of theirlevel of visual impairment. That means that while women suffer more from visual impairments then men, they are less likelyto seek eye care compared to men. When further explored,the majority of women who never sought any kind of eye care in spite of having a visual impairment are living with a married son and are without a spouse. However, it was found that if a woman is without a spouse and is living with a married daughter she is also likely to not seek eye care. In both the cases, the majority of women are either fully or partially dependent on theirsonfor financial assistance. Among the male respondents who never sought eye care for their visual impairments, are majorly living with spouse and married son. Regarding health care decisions, while most of the male respondents independently decided whether or not to seek health care, female respondents’ sons made health care decisions on their behalf. This implies very high dependency of the female elderly on male members of their family, especially their son. The study shows a dismal picture of eye care seeking among the elderly women of the Sundarbans. It demonstrates the importance of using a gender and intersectional lens that brings out how gender cross cuts other social determinants of health to determine the eye care seeking process for the elderly. It is therefore important that health decision makers, instead of considering gender in isolation, use an intersectional lens to ensure equitable and effective health service delivery. This blog was originally posted on Health Systems Global.